Design and materials: The timber framed house exceeds Passivhaus performance standards, and has a SAP EPC rating of A107, meaning that it is a net energy exporter. However, it is not Passivhaus certified. It was constructed by MBC Timberframe, There are no dug foundations, and the house sits on a recycled polystyrene base, with a thin (100mm) internal reinforced concrete floor slab. 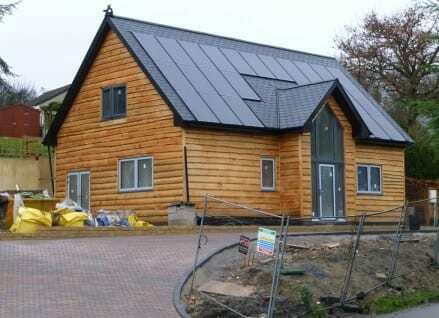 The frame was made off-site, and is FSC certified, with local larch cladding, at Ansty. The Ikoslate roof slates are made from recycled plastic and car tyres. Overall build cost, excluding initial site preparation, will be around £160,000 (£1230/m2 of internal floor area). Insulation: The house faces South to make the most of solar gain. Floor insulation and wall insulation (from recycled newspapers) are 300mm, while there is 400mm in the roof. Tested air tightness was 1.22m3/h/m2 compared to 10m3/h/m2,required by Building Regulations. Heating, ventilation and hot water: As a low energy home, it has minimal heating (~1.6kW maximum) for when the temperature reaches minus 10°C or less. A Danish Genvexmechanical ventilation and heat recovery (MVHR) system has been installed, and a small air source heat pump (ASHP) provides underfloor heating for very cold days. Hot water is provided by pre-heat from the air source heat pump, with the thermal store heated by the excess energy from the solar PV on the roof. Windows and doors: Triple glazed from Munster Joinery. They are argon filled, soft E coated, Passivhaus Institut certified, made from sustainable timber with external aluminium cladding. U value 0.7W/m2.K. Lighting, appliances and electricity generation: Lighting is a mix of LED downlights and low energy (CFL) wall mounted uplighters, with occupancy sensors in little used rooms. All appliances are A rated or better. The 6.25kW photovoltaic array is built into the roof, with a controller to divert excess energy to the heat store. The Client already has an electric bicycle and a partially electric car (Toyota Prius hybrid). Water: Off-grid water supply from a private borehole, with no connection to the mains water supply, plus Bio-pure package sewage treatment plant. This choice was due to the expense of getting water and sewage to the site. However, running costs will be around £180-200 per year.